Standard and Heirloom versions available. 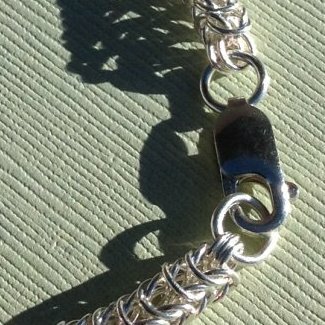 A beautiful sterling silver women’s chain bracelet. 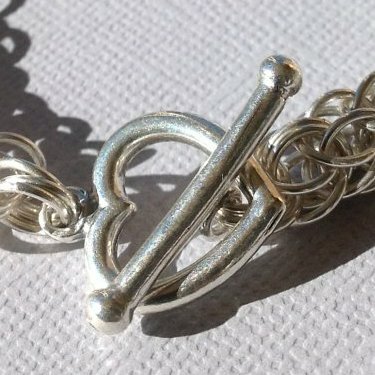 The Candy Cane Cord chainmaille weave is fine jewelry. A sparkling, intricate, and glamorous show-off piece. The Candy Cane Cord is a lesser-known variation of the Full Persian chain weave, so you will likely be the only person who has one–to the envy of your friends. It features a really neat criss-cross pattern that gives this bracelet its lacy look. 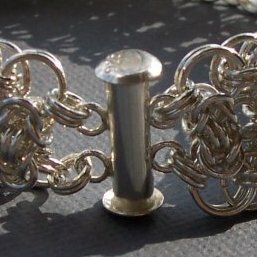 At 7 inches, this bracelet has 0.7 ounces of silver (0.7381 troy ounces, 19.85 grams). It has a very pleasing weight. Note to men shoppers: This would make a stunning gift.